The Mars Reconnaissance Orbiter (MRO) is a spacecraft that beams back high-resolution imagery of the Red Planet's surface. Some of its notable investigations include searching for ice and water, finding a landing spot for the Mars Curiosity rover, and imaging a close-flying comet called Comet Siding Spring in 2014. It has also provided high-resolution imagery of recurring slope lineae, crater streaks that may be due to dust features or briny surface water. The spacecraft also serves as a communication relay for the Opportunity rover and the Curiosity rover on the surface of Mars. MRO completed 50,000 laps around Mars in March 2017. In February 2018, NASA said it plans to operate the spacecraft beyond the mid-2020s, an extraordinary feat given that the mission was initially designed for two years at Mars. That decision is due in large part to focus limited Mars mission dollars on sample return, and to push a planned replacement orbiter until the late 2020s, according to Spaceflight Now. With MRO extending its mission, it will support the future Mars 2020 NASA rover as well as a possible sample-return mission to Mars. While some of MRO's instruments and engineering components show signs of aging, NASA is implementing workarounds. For example, it is using a star tracker to help maintain MRO's attitude, lessening the reliance on old gyroscopes. Some images from its high-resolution camera, HiRISE, have a little bit of blurring and the cause is still under investigation. A spectrometer instrument called CRISM has lost most of the cryocoolers it brought to Mars, but it can still do observations in some wavelengths. MRO is part of a long line of NASA missions focused on searching for evidence of ancient habitability on the Red Planet. The first launch opportunity for MRO (which was not named at the time) would have been in 2003, according to NASA, but NASA elected to send the Mars Exploration Rovers (Spirit and Opportunity) to Mars instead. The agency elected to go with the rovers to allow for landings in two locations, something that an orbiter would not provide. In 2001, NASA selected Lockheed Martin as the primary constructor for the spacecraft, which was targeted for a 2005 launch date. Characterize the geology of Mars, focusing particularly on areas that may have had liquid water. To accomplish these goals, MRO carries multiple instruments and experiments. It has three cameras – High Resolution Imaging Science Experiment (HiRISE), Context Camera (CTX) and Mars Color Imager (MARCI). In addition, MRO has a spectrometer called Compact Reconnaissance Imaging Spectrometer for Mars (CRISM), a radiometer called the Mars Climate Sounder (MCS), and a radar instrument called Shallow Radar (SHARAD). It also has three engineering instruments — a communications and navigation package to "talk" with landers and rovers on the surface, an optical navigation camera to test interplanetary navigation and an experiment package to test a powerful radio band called Ka-band at Mars. MRO's two science facility experiments include a gravity field investigation package and accelerometers to show the structure of the Martian atmosphere. Before launch, NASA promised that the spacecraft would beam back information three times faster than a conventional broadband telephone connection. This meant that scientists would receive information faster than ever before — which would be especially important when sending back data from rovers and other spacecraft on the surface of the Red Planet. MRO launched Aug. 12, 2005, and tested out its super-speed capabilities in September, when it snapped some pictures of Earth's moon from 6 million miles (10 million kilometers) away. It then sent back 75 gigabits of data to Earth, which is the equivalent of about 13 CDs of information. That was a record amount of data at the time. The spacecraft made it into Martian orbit on March 10, 2006, and began beaming back images right away while putting itself into the correct orbit. MRO used a technique called aerobraking — brushing against the Martian atmosphere — to adjust its orbit. This process saves fuel and money, but takes a lot of time. MRO completed the challenging maneuvers successfully in September, after six months of adjustments. One of MRO's first targets was the Opportunity rover. Opportunity, which had outlasted its 90-day mission by more than two years in October 2006, was on the edge of the Victoria crater. MRO sent a high-resolution picture not only showing the rover and its tracks, but also a shadow cast by the golf-cart sized vehicle on Mars. After snapping some pictures of Opportunity's twin, Spirit, as well as the two Viking landers that arrived in 1976, MRO's team then had progressed far enough to begin releasing science results. In December 2006, some of MRO's first radar observations and pictures focused on layers of ice near the poles. "These deposits record relatively recent climate variations on Mars, like recent ice ages on Earth," said Ken Herkenhoff, from the U.S. Geological Survey, in a press release issued that month. But MRO's high-resolution pictures briefly came under threat. In February 2007, NASA reported that the HiRISE camera was experiencing problems with "bad pixels" and other image noise in some of the camera detectors. The problem initially appeared to be worsening with time, but NASA traced the problem to a design flaw and said it successfully took steps to address it. One of MRO's first "safe mode" glitches occurred in March 2007, when a technical problem forced it to switch to a backup computer temporarily. During the early part of its mission, part of MRO's work involved searching for suitable Curiosity landing sites; the eventual target was Gale Crater, where Curiosity landed safely in 2012. It explored the crater floor and as of mid-2018, is currently making its way up a nearby mountain called Aeolis Mons (Mount Sharp) in search of ancient evidence of water. MRO also relayed information from the Spirit, Opportunity and Phoenix spacecraft. When Phoenix lost contact with Earth in 2008, MRO snapped a picture showing ice and damage on the spacecraft. Spirit permanently lost contact with Earth in 2010, but Opportunity was still working on the surface until at least June 2018, when a dust storm blocked sunlight and put the rover into a low-power mode. In 2007, MRO scrutinized two Martian gullies previously imaged by Mars Global Surveyor. Researchers earlier speculated that changes in the gullies came from flowing water, but the new, sharper MRO images revealed these are likely from "landslides of loose, dry materials." An illustration of the Mars Reconnaissance Orbiter based on the final design. Later that year, MRO beamed back pictures of puzzling features on Mars that scientists dubbed "spiders" and "lizard skin." Researchers said the strange shapes were probably due to carbon dioxide gas popping out in the spring and shaping the terrain. Bright "fans" of material spotted on the surface were likely carbon dioxide frost. One of MRO's greatest finds came in 2008, when the orbiter spotted clay-rich rock in Mawrth Vallis. This channel, in the northern hemisphere of the Red Planet, has several different types of clay overlying each other. Scientists said this probably happened when water mixed with basalt within the northern highlands. Later that year, the spacecraft beamed back evidence of opal (or hydrated silica) sprawling across Mars — a big calling card for water. According to scientists, water on the Red Planet was present as recently as 2 billion years ago, which is a billion years later than previously believed. In 2009 NASA suspended science operations for months due to frequent orbital computer resets. NASA sent a software upgrade to the ailing craft. Then, managers carefully brought MRO out of safe mode to resume work Dec. 16. A 2010 discovery of massive frozen carbon dioxide deposits at the south pole led scientists to believe that dry ice enters the atmosphere when Mars increases the tilt of its axis. High-resolution imagery of the surface continues to come back from MRO, including observations of “ice spiders” and sand dunes in 2014. 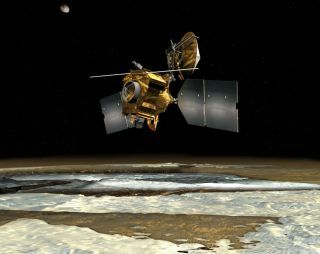 Scientists also learned new things about the atmosphere of Mars courtesy of the spacecraft. As the planet's tilt changes, liquid water on the surface is also affected as well as the number and severity of Mars' famous dust storms. MRO has seen avalanches, dust devils and rock fractures from orbit, giving close-up views of changes on Mars over several years. The spacecraft beamed back stunning imagery of Comet Siding Spring when the celestial visitor flew relatively close to the planet in October 2014. Its pictures of the comet, which whizzed by 86,000 miles (138,000 kilometers) away, were described by NASA at the time as "the highest-resolution views ever acquired of a comet coming from the Oort Cloud at the fringes of the solar system." MRO's imagery of the surface helped European scientists figure out the trajectory of the failed ExoMars Schiaparelli lander during its approach in 2016. That same year, the spacecraft also found the graveyard of the 2003 Beagle mission, another European spacecraft that didn't arrive safely on the surface. In 2017, the spacecraft saw extensive evidence for volcanic eruptions on the floor of Valles Marineris, a large canyon system that spans nearly a fifth of the Red Planet's circumference. The evidence for water ice continues to pile up, including hints of ice in Martian slopes announced in 2017, and vast sheets of subsurface water ice, providing a possible resource for future Mars missions. In June 2018, pictures from MRO showed a dust storm covering the entire planet. With less sunlight reaching the surface, the storm knocked out operations for the solar-powered Opportunity rover, but the nuclear-powered Curiosity continued to perform science observations.